Shop a comprehensive selection of 1oz gold bars from some of the world’s most prestigious manufacturers including Valcambi, Heraeus and the Perth Mint. 1oz is a highly popular size for investment purposes and one ounce gold bars can be easily added to existing stock or pension plans. Just look at our historic gold charts and you’ll see that gold invariably retains or increases its value, even when currency markets are in crisis. 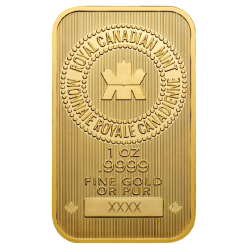 The demand for fine .9999 gold never falters and the classic 1oz gold bar is universally recognised and highly tradeable. Our 1oz gold bars are sourced from LBMA approved manufacturers and they can be supplied individually or in larger quantities. Plus, all gold 1oz bars are free from VAT to EU-based clients. Benefit from our low premiums and fast delivery.